Beatriz and her son, Juan Pablo, in their home in Cali, Colombia. Sponsored children in Unbound’s programs make up the foundation of our global community, but it’s often their parents who are empowered by the benefits of sponsorship to make decisions for their family that foster growth out of poverty. That’s why you hear so many stories about mothers and fathers here on the blog. Beatriz in Cali, Colombia, is the mother of 11-year-old Juan Pablo, who is sponsored by David in Arizona. She took some time to share her story about overcoming hardship with Henry Flores, our communications team member based in Colombia. Henry: Tell us about yourself. Beatriz: I live in the community of Alto Napoles, in the municipality of Cali Valle. I have two children, Juan Pablo, 11, and Luisa Fernanda, 18. Henry: How was your childhood and youth? Beatriz: My dad worked in agriculture and my mother was a housewife. I am the second of my [seven] siblings. [Childhood] was hard, we lacked many things, we did not have electricity at home, our house was small and made out of bahareque (mud and corn sticks), and the roof was made out of palm tree leaves. We all slept in the same room. I was able to graduate from high school. When I graduated, I went to work with a lady who used to make dresses. This was in my small town and of course I didn’t make much, and what I really wanted was to help my parents so I decided to move to Cali (a large city about three hours away). I was 21 years old. I met the father of my children when I was 26. We stayed together for many years, but he abandoned us a few months ago. I stayed alone with my two children. Four years before, I had decided to learn to make sandals and purses and started to sell them around my community. At the beginning it was difficult but I have always worked, in spite of my situation, I’ve worked to move forward. This helped me to make some money to cover my kids’ needs. But when he left, I was struggling because I could not cover their needs. Henry: What is like to be a woman in Colombia, what do they face? Beatriz: It is very difficult, very hard. If you don´t have the resources, one faces many obstacles and burdens. For a woman it is hard to find a job after you are 30 years old. There is a lot of pressure on [appearance]. So trying to find a job at a company is very difficult. But one thing I learned from my work is that I could have my business at home and make some income, as well as taking care of my children and my house, so I am happy for that because even though my community is nice, there are drug addiction problems. Henry: How did you find Unbound? Beatriz: A friend of mine told me about [Unbound] and went with me to the office. The social workers were very nice. They explained to me about the program and put us on the waiting list. We only waited for about one month and my son, Juan Pablo, became sponsored. It was fast. Beatriz hard at work making sandals in the workshop area of her home. Henry: How did your life changed when you became part of Unbound? Beatriz: Many things changed. For example, I had never received [any kind of training], I never had the opportunity to be able to express myself and have people actually listen to me. We, the mothers of sponsored, shared our experiences. We had a place where we could share our burdens, fears and problems. We always say that this is “our space,” and when we finish the meetings, we come up refreshed, relieved and joyful. At the same time, the benefits made a great impact in my life. I was struggling with my income, so I could not afford uniforms, school supplies, etc. My husband did not help us anymore, so having the support from Unbound was a way for me to buy many things my son needed and enabled me to cover my daughter’s needs. Henry: What kind of products do you make? Beatriz: I make sandals, people order them and I make them. In one week I can make about a dozen of them. It is all made by hand. I buy the materials and make them on my old sewing machine. I have different prices. For the simplest ones, I can make $3 USD profit. Beatriz cuts leather for her next pair of sandals. She gets design inspiration from magazines but also relies on her own creativity. Some of the beautiful sandals that Beatriz makes using her sewing machine. Henry: What are your dreams for your children? Beatriz: I want to see them grow as good adults, complete their higher education and become professionals. Henry: What are your dreams for you as a woman? Beatriz: I want my business to grow. I want to make it big and create jobs. I want to create new styles and models, new products, backpacks, etc. I would like my product to have higher quality. I did not go to school to learn. I saw how they made one purse and did it all by myself, so I want my final product to be even better than it already is. Henry: What does Unbound mean in your life? Beatriz: A great blessing. I am deeply thankful for Unbound. When I speak about it, I do it with much pride and joy, because I am part of it and it is mine. Through sponsorship, you can help a parent stabilize her household. Learn more. 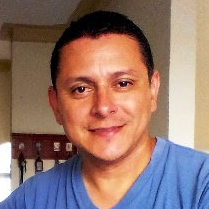 Based in Colombia, Henry Flores has been with Unbound for more than two decades, serving as translator, subproject coordinator, project coordinator, regional director for Guatemala and El Salvador, and now as communications liaisons director. His experience working with Unbound has deepened his belief that families living in poverty can become empowered and self-sufficient.